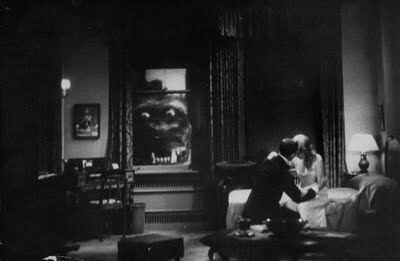 Remember the scene in King Kong where the giant ape peers through a hotel window and sees people inside? James Currie, a South African “bird expert” who hosts some sort of TV show somewhere, reveals that “there’s nothing I love more than spending time with my family and witnessing the miracle of nature with the My Spy Birdhouse”which is less an endorsement of the product than an admission that Mr. Currie needs to expand his hobbies and interests. 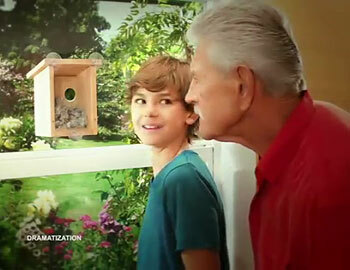 This commercial assures us that My Spy Birdhouse “helps kids learn to observe and not disturb” birds. 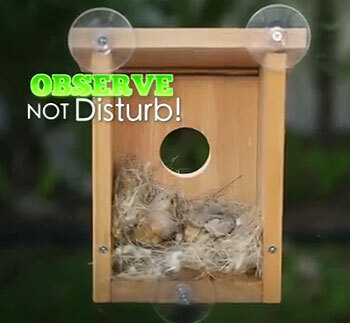 That’s true, assuming birds won’t be disturbed by your kid shoving his face against the window, tapping on the glass, shouting, and otherwise trying to get the birds’ attention. 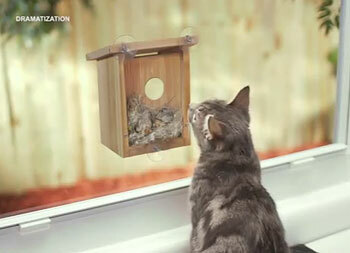 Even more appalling, they show a cat eyeing the birds and pretend this is some sort of desirable product feature. Not only will the birds be terrified at the sight of their natural predator, but your cat will be frustrated at not being able to consume his breakfast even though it is mere millimeters away from him. “What happens when [birds] disappear inside their house?” sounds like the question of someone making the troubling transition from bird watcher to bird stalker. 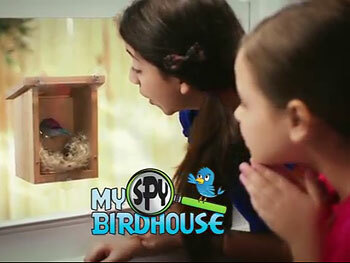 My Spy Birdhouse will do much to “educate” your kids into becoming Peeping Toms. The boy who says, “Wow, I can see everything!” seems like he’s well on his way to his first restraining order. Perhaps our feathered friends would tolerate being ogled and gawked at all day in exchange for a safe and secure dwelling. But My Spy Birdhouse is held up with suction cupsthe same things that can’t keep your “Baby On Board” sign attached to your car window for more than 22 hours. If the sight of your face or if the unstable suction cups end up scaring birds away, all is not lost. You can just stick a Perfect Polly Pet inside it instead. Ordered 2 of the bird houses to be delivered to the same address. I was charged $15 for shipping and handling for each one of the houses. Pay attention to the commercial next time. It’s a two-way mirror, meaning you see the birds but they CAN’T see you. Haha, wait. You know that already. My bad. I ordered one of these almost 2 weeks ago and still haven’t received it. Anyone actually have one and use it? Have any birds inhabited your birdhouse? Never came. Ordered 3+ weeks ago.. now the site isn’t working…. Ordered ages ago and now I can’t get a hold of them to cancel!! Anyone have a number for them??? I ordered this almost a month ago and it hasn’t arrived. Their website is no longer up either. Does anyone know how to reach them for a refund?!!! I ordered my birdhouse in March and just got it two days ago. They have too many orders to fill so it is taking longer for them to ship them. It WILL come but it’ll take some time. And by the way… it is only a thin two way mirror film not an actual mirror. And I believe I didn’t get my guide. Update: ordered mine April 1st… Site was down n number not working and this morning there is a charge for it on my account…. It better come asap! I ordered mine Apr 5. Called May 16 and was told it was on back order. Got a card in the mail around May 25 saying that it would be delivered June 5. On June 4 I got an email that my order had been cancelled. However there has not been a deposit back into my checking account for the money they already debited. The website is no longer working and I was on hold for more than 30min for thier customer service. RIP OFF!!! Dont think I wont take action!! BUYER BEWARE! I was perusing their website with the intention of buying 2 My Spy Birdhouses. I put in my credit card info and then saw that there was a $7.99 P&H charge for each. This was more than I wanted to spend, so I left the webpage. Upon checking my email 15 minutes later, I learned their website processed the order without giving me an opportunity to review the order and approve it. Giving the customer the opportunity to review an online order is standard business practice. I immediately contacted the Customer Service number and was told, “You should have looked at the small print at the bottom of our website to see what you were agreeing to.” I did not appreciate the defensive tone of the CSR or the cavalier “Caveat Emptor” attitude (“Let the Buyer Beware”). I was then told to “call back in 2 to 24 hours” to be able to cancel my order. WTF? Not to be dense, but wouldn’t anyone with a few rudimentary woodworking skills be able to build his or her own? At any rate, unless you disguised the window to look like a tree, I doubt that any bird with half a brain would go near the thing. People should leave nature alone. There is a reason why birds make their nest away from people and animals. I think it could be very disturbing for a bird to see people faces or a cat or dog face right next to them… This invention is just people trying to make money whitout considering the animals wellbeing…. All the comments remind me of Obama’s health care website! The two way mirror thing is totally bogus. Two way mirrors work on the principle that the observer has to be on the side of the mirror with the least light. Very little light will come in through the bird entrance hole so the only real light is that coming from inside the house – thus the birds will see the people, not the other way around. Think about it – which is easier to see, looking out from a car or looking into it from the sun-lit outside? Same principle here. The two way mirror comment is correct. The birds would see you, and you wouldn’t be able to see the birds. Birds are picky about where they build a nest. The slightest movement can discourage a bird from building a nest in any given location. So, the terrifying the birds, the not being able to see the birds through the mirror, and all the rest is are mute points since no bird in his right mind is going to use such a birdhouse. The only one in actual use is the one they set up for the commercial. I ordered this for my husband on December 18th as a Christmas gift after seeing the infomercial. I ordered the “special” – the second birdhouse for only s&h and the free window birdfeeder included. I realized that, only a week before Christmas, it may not arrive in time but that was reasonable, no worries. On December 19th, a rep from the customer called me to “thank me for ordering” but, in reality, was trying to sell me something else, telling me they were sending me some blah blah blah ( can’t remember what it was) and if I kept it, I would be billed. Only if I cancelled, would I not be billed. I asked – “Wait, so you are sending me something unsolicited that I have to take the time to cancel in order not to be billed?” He said no, he was asking me know if he could send it. No, thank you. I was a little annoyed that a simple online purchase turned into a slick sales call for something else. I then asked the rep – “What are my chances of this arriving for Christmas?” He was very vague as he said “it’s shipping right away”. Ok – again, I understand that a week before Christmas there are no promises. My credit card was not billed until six days later on the 24th. The product did not arrive until 13 business days later on January 2nd. And when it did arrive, there was no bird feeder. And the product, while it appears to be wooden on the infomercial, is plastic and pretty junky. Definitely not worth $15.00 IMO. Spend a few extra dollars and buy one of the much better quality wooden products that are out there and where you probably will not get a slick sales call the next day that, if you are not paying attention, will cost you more money. I ordered the birdhouse. Maybe they changed it but the one I got was PLASTIC NOT WOOD. False advertising if ever there was. They also tried to send me a special and I told them not to send it. Plastic is a ripoff for the price. Could build it out of wood for less. Good lord, how dumb do you have to be to not realize this is a BAD idea. I weep for our future. Let’s attract birds to fly into/near windows! If it doesn’t kill them right out, let’s spy on them and scare the living doo-doo out of them, tap, yell etc. and then have the dang thing/house/eggs/chicks fall off the window because of silly suction cups and die. Wise up America! We ordered one and have never been able to “peel the backing of the 2-way mirror film” away. Plus, if it’s 2-way, how come we can see through both sides of it? Thank you to everyone who is thinking on this one. The one way mirror film ONLY allows the birds to see you, not the other way around (based on the light source inside the house… good call) and aside from House Sparrows which we don’t want to encourage, no native species would put up with movement inside the house even if they only saw it as they were approaching the box on the window. 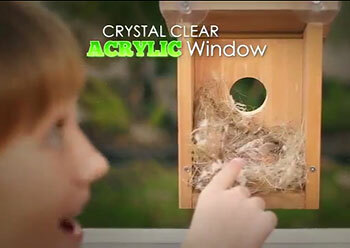 The birds using the box in the commercial are Canaries or something, certainly not native birds. And did you notice that as they change the picture to claim that they are showing you a Wren nest, then a Nuthatch nest and then a Chickadee nest, they show you THE SAME NEST! Those birds each build a unique type of nest. It infuriates me that they think so little of the public to make such a misleading commercial. Attached to the window by suction cups, this does not seem safe for birds. I strong wind and rain storm could easily cause the suction cups to let go and the poor birds could come crashing down and die. This is not for people who truly care about birds. The biggest objection to buying anything advertised on TV in which you have to pay for shipping & handling is having to pay for shipping & handling. It’s nuts as the one guy said he paid $16. for each bird house. If you can buy it at a store do so even if you have to drive an hour. The bird hose it self sounds like a cool idea and the reviews are good. Although the reviews are good I still really like this article, especially the reference to king kong peering through the window . This entire article is quite good and humorous. If I could get the one way glass I’d make the bird house myself as I said it’s a pretty cool idea. If you have thought about buying it I would , but just don’t pay for shipping. Every single item sold on TV requires shipping & handling and it’s nothing , but a rip off! The most disturbing thing about all this. TO ME. If it is meant to let you see In but the birds can Not see You — THIS WOULD INDICATE A “ONE WAY MIRROR” Not a Two Way Mirror? Otherwise YOU wouldnt be able to see iN Either? You can buy 2-way mirror film and make your own or adapt a birdhouse you bought using that and a bit of plexiglass. But I’d agree about the suction cups, you probably want something stronger. But maybe it should not be used on a window near a lot of traffic due to the noise, and I think if you turn the lights on at light the 2-way mirror acts the OPPOSITE way. I am someone who has watched and studied birds for over 50 years. Its not an absolutely terrible idea except for the suction cups holding it up. I think most people that would order this would respect the birds need for minimal activity but the probability of falling is enough to scare me away from it. I have yet to find anything held up by suction cups that didn’t fall at the first blast of hot weather. I think that we should probably stick with a properly placed and designed wooden birdhouse placed in a tree with the proper entrance sizing and no perch since they do not need it. A perch only helps predators. Put up an old fashioned wooden house if you want to give the birds alternative nesting options. The plastic design will very likely be nixed by the very choosey prospective tenants.